During the difficult times that the Middle East has been going through, Jordan is considered to be a safe haven for the refugees from the surrounding countries. However, This situation is not a new one as Jordan has been considered the second home of Palestinians and their only path to travel. The video contains several people from different Arab nationalities -based in Jordan in the meantime- singing the Anthem of their countries or the country where they were raised or currently live in. While the videos can be understood within the broader context of the Arab struggles, it simply and persistently also tries to negotiate existence and place in this part of the world. 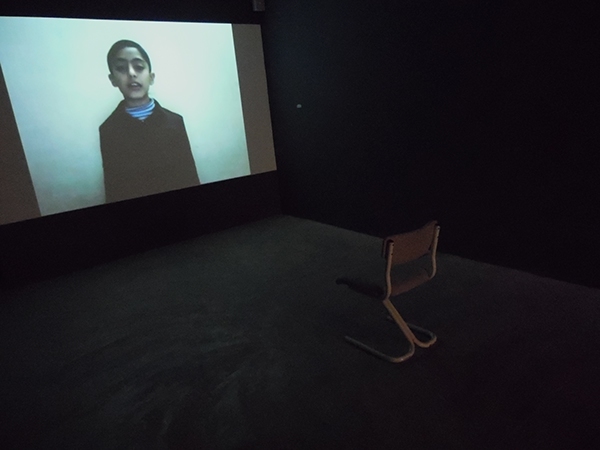 These videos are dealing with how identity is shaped in a context of inaccessibility and loss. it concerned with barriers, land, longing and, ultimately, belonging..
During the process leading to these videos, it became increasingly clear to me how barriers, land, longing, and “identity” inform, shape and define each other. This work explores the boundaries between portraiture, identity and performance art. The concept of this video comes from a personal story where I was raised in UAE and as a Palestinian kid I used to stand in the morning queue at school with the other students singing the Emirate Anthem, trying carefully to replace the word «Our Emirate» with «Our Palestine» with no one noticing. Going home for many awakens nostalgic feelings and fond memories of childhood. But for the Palestinian, the identity of home is often highly contested. Many Palestinians who have lived within the region or who have ties to the area often feel displaced as they struggle with notions of national identity and strive to retain their heritage. I worked on this one while being in Jordan, because I wanted to benefit from the current situation where Jordan is considered as the «Safest Area» in the region. Jordan hosts Arabs from Syria, Iraq, Egypt and of course Palestine. The video contains several people from different Arab nationalities -based in Jordan in the meantime- singing the Anthem of their countries or the country where they were raised or currently live in. While the videos can be understood within the broader context of the Arab struggles, it simply and persistently also tries to negotiate existence and place in this part of the world. These videos are dealing with how identity is shaped in a context of inaccessibility and loss. it concerned with barriers, land, longing and, ultimately, belonging.. During the process leading to these videos, it became increasingly clear to me how barriers, land, longing, and “identity” inform, shape and define each other. This work explores the boundaries between portraiture, identity and performance art.